We are using AlwaysOn Availability Group feature of SQL Server 2012. Regular full database backups and transaction log backups are done every day on the secondary database. I have restore the database locally and perform the shrink operation. The log file size was reduces to 160 MB. My question is on which database should I perform a shrink operation over the transaction log file (primary, secondary or both)? I guess in the past for several years no back ups of the log file are made, so it become so huge. Executing DBCC SQLPERF (LOGSPACE) I can see that only 0.06% of the file are used - there is no point for me to keep such huge size of the log file. In [sys]. [database_files] I check that its max_size is set to -1 with growth to 65536 so I guess when it need more space it will get. Anyway, I can shrink it to 5% for example in order to prevent future growth. I am trying to find some confirmation that I it is not bad idea to do so. Actually, back ups (on the database and the log files) are performed only on the secondary databases, so it will be easier to perform the shrink file on them, but will the primary log file size be reduced as well? In AGs writes can only occur on the primary. Shrink operations are writes. Therefore you must do the shrink on the primary. Note that the shrink may not shrink as much as you expect, your test on the restored DB had probably leveraged simple recovery model. 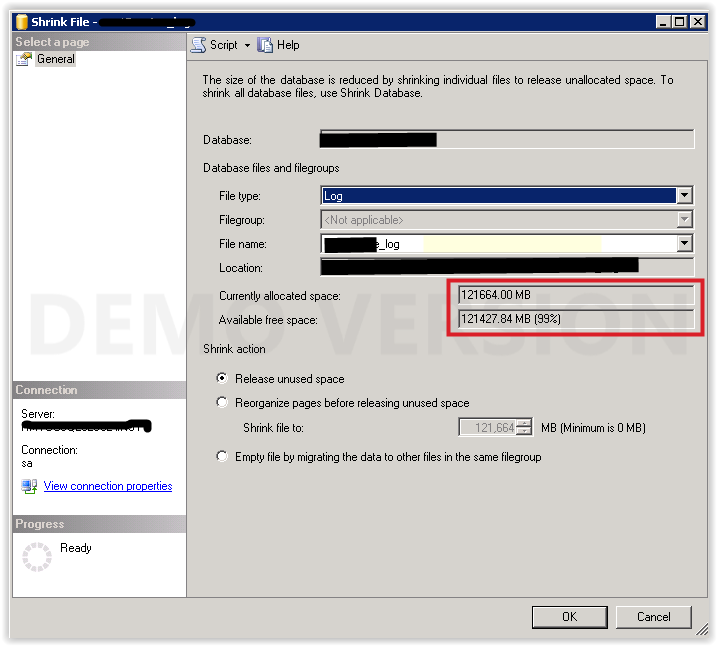 Read How to shrink the SQL Server log for more info. Database on all servers in Availability Group should be in Synchronized state. Move used pages to start of the transaction log, before you shrink it. Sometimes available free space of log is 99%, but SQL Server can't release unused space. Try to reboot each server in Availability Group in turn. Sometimes you need to bakup and shrink transaction log 2 times before MS SQL Server released free space (Cannot shrink log file (DB_Log) because the logical log file located at the end of the file is in use.). Not the answer you're looking for? Browse other questions tagged sql-server sql-server-2012 transaction-log shrink or ask your own question.